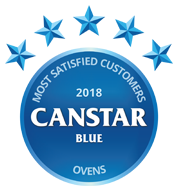 Canstar Blue’s annual oven review has seen seven major brands rated on cooking performance and reliability, functionality, ease of cleaning, design and overall satisfaction. Compared brands include Bosch, Smeg, Miele, Fisher & Paykel, Electrolux, Westinghouse and Chef. For the third year in succession, Bosch has topped Canstar Blue’s customer ratings for ovens, scoring five-star reviews for its cooking performance & reliability, functionality, ease of cleaning, design and overall satisfaction. Shopping for a new oven isn’t something you do every weekend, but the fact that you’ve ended up on this page suggests it’s that time of the decade again! As one of the biggest and most important things you’ll buy for your kitchen, it pays to do your research and make an informed decision. 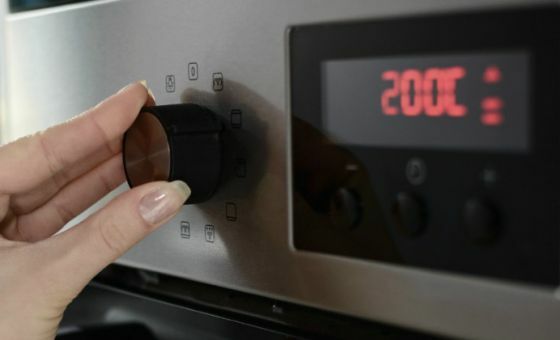 While the oven basics won’t have changed much since your last purchase, you may find many more techy features and functions on ovens these days, so make sure you consider exactly what you need and want before you reach for your credit card. Our 2018 oven review and ratings might be the perfect tool to help you decide which oven you should consider for your next purchase. Each year, we survey hundreds of Australian households to find out which ovens are keeping families happy. This year, seven leading brands have been compared on their cooking performance and reliability, functionality, design and ease of cleaning. So, which brands are cooking up a treat and which are feeling the heat from their customers? The only other five-star ratings in our 2018 review were achieved by Miele for functionality and design. It was four stars overall for Smeg, Miele, Fisher & Paykel, Electrolux and Westinghouse, while Chef only received three stars. It’s probably fair to say that the top three brands mentioned above – Bosch, Smeg and Miele – are some of the most premium (and therefore expensive) available. So what does that tell you? Well, perhaps that investing in a quality oven will prove a sound financial move now and in the long run. If you’ve ever been frustrated by a temperamental oven, or just left disappointed by its performance, then it may be time to upgrade. 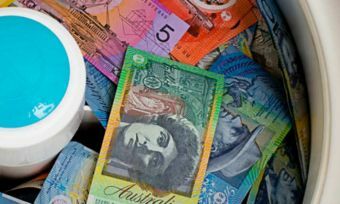 Almost one in four Aussie households (23%) wish they had spent more on a better oven, with one in five (21%) stating they’re often disappointed with their oven’s cooking performance, our latest survey found. If you’re one of them, make sure you give serious consideration to which oven you buy next. Ovens are not the easiest of appliances to replace – especially after being installed – and you won’t want to be left with buyer’s remorse. To help you decide which oven will be the best fit for your home, here is an overview of what the seven brands in this year’s review have to offer. We’ll also look at some of the best brands not included in our 2018 ratings. Bosch is a well-renowned name in the home appliance world, and the German manufacturing giant is synonymous with quality and technology. 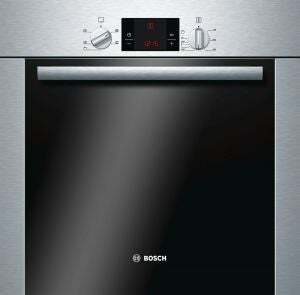 Bosch offers the Australian consumer a wide range of over 20 ovens, both electric and gas. Bosch puts technology at the forefront of its design ethos, with soft-open and close doors, a multitude of cooking programs and displays, as well as auto-pilot functions such as ‘PerfectBake’ and ‘PerfectRoast’. Bosch ovens generally come in at the premium end of the spectrum, with most above the $2,000 mark, but some can be found for a bit less. The Bosch 60cm Serie 6 Electric Built-in Oven (HBA13B253A) has a retail price tag of $1,149 and is equipped with self-cleaning technology, a stainless steel design as well as a cooling fan to cool down the oven and prevent components from overheating. Bosch was rated five stars in every category in 2018. Smeg is an Italian appliance manufacturer providing “elegant contemporary living solutions” for Aussie kitchens. 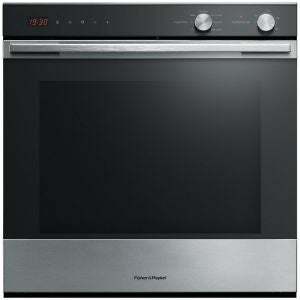 Many of its ovens are rather chic in appearance, with touch displays and sleek silver finishes. Many models feature its countless ‘smart sense’ personal cooking programs, as well as advanced safety features. It has over 30 models to choose from, one of which is the Smeg 60cm Classic Aesthetic Electric Built-In Oven (SFA6304X) designed with an electric grill, lockable dials and a stainless steel finish. Oven capacities generally hover around the 80L mark, and prices are typically between $2,000 and $3,000. However, expect to pay more for pyrolytic varieties, around $4,000, which boast 90-minute auto-cleaning times. This year, Smeg was rated a respectable four stars for overall satisfaction as well as for every other category, making it a solid performer. Miele is a well-regarded home appliance brand, with many of its products still manufactured in Germany. Miele offers an extensive range of ovens in Australia, with a strong focus on durability and ease of use. Especially with the higher-end models, expect features like self-cleaning, easy-clean enamel finishes, cool-touch doors, multiple programs and functions, as well as ‘Flexiclip’ runners which allow you to baste and turn meat without risk of burning yourself. Miele has proved a hugely popular brand in Canstar Blue’s research over the years, but its prices are generally more expensive than most other brands, with some ovens costing $7,000 or more. 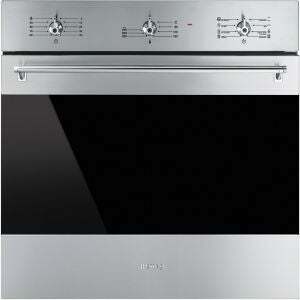 Its most expensive model – Miele 90cm Oven H 6890 BP – has a retail price tag of $14,499. However, you can find several models priced around the $2,000 mark. Miele rated four stars for overall satisfaction in 2018, while also receiving five stars for functionality and design. It was rated three stars for ease of cleaning. Founded in New Zealand, Fisher & Paykel is a company that has been around for more than 80 years. During that time, it has emerged as one of the most technologically-advanced appliance brands and is a popular choice in Aussie kitchens. Fisher & Paykel has a huge range of ovens, with around 30 in total. It’s a brand that also specialises in double ovens. Fisher & Paykel even makes pyrolytic ovens, but these fetch a price premium as you might expect, due to their self-cleaning nature. Fisher & Paykel has a wide variety of price ranges, starting at around $1,000, with most sitting under $2,000, while some cost $6,000 or more! This year, Fisher & Paykel was rated four stars overall as well as for design, with three stars on cooking performance and reliability, functionality and ease of cleaning. For all things ‘home appliances’, Electrolux remains a global leader. The Swedish brand is a giant in the appliances industry, producing all manner of ovens, including electric, pyrolytic and steam ovens. Some models are very large in capacity, over 100L in fact. Most feature Swedish ingenuity in features like ‘IOI’ technology – Intuitive Oven Interface – which claims to eliminate the need for instruction manuals. 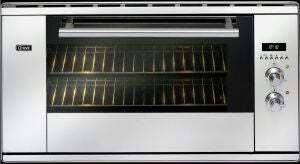 Electrolux ovens come at a wide range of prices, some costing as much as $5,000, while others cost a modest $2,000. 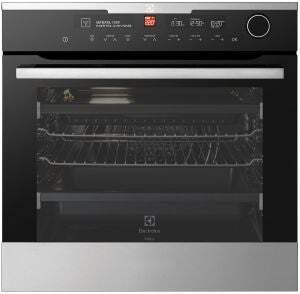 The 60cm Electric Built-In Pyrolytic Oven (EVEP618SC) has a retail price tag of $3,849 and is boasted for the ‘Smart Food Probe’ that’s stated to measure the core temperature of food and switch off the oven when it’s ready. Electrolux was rated four stars for overall satisfaction in 2018, as well as ease of cleaning, design and functionality. It was just three stars in cooking performance and reliability. A subsidiary of Electrolux, Westinghouse still makes some quality ovens. Besides the traditional ovens that many know and love, Westinghouse produces pyrolytic ovens amongst its vast range of more than 30 models. Some are known for their big capacities, and kid-friendly features such as cool doors, child locks and fingerprint-resistance. 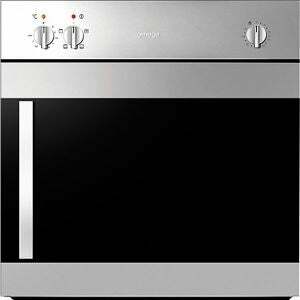 The Westinghouse 60cm Electric Built-In Oven (WVE615S) has a modest retail price tag of $1,249 and is boasted for some of these features as well as a delayed start option and five cooking functions such as the pizza mode. 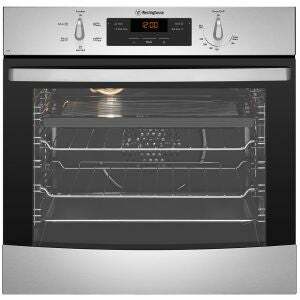 Westinghouse is usually one of the cheaper brands around, with many ovens costing around $1,000. However, expect techy features at the cheaper end to be rather scarce. Its most expensive models sit around $3,500. Westinghouse was rated four stars for overall satisfaction and in two other categories – functionality and design. It was rated three stars in every other category, including cooking performance/reliability and ease of cleaning. As the name suggests, Chef specialises in all appliances that cook, and in particular – ovens. Chef has been around for a while now, with 10 models on the Australian market at the time of writing. Chef is known as a budget-oriented brand with many models costing less than $1,000. What Chef seems to focus on is straightforward cooking with no real gimmicks, with only a few models featuring pyrolytic self-cleaning. Chef features only electric ovens with both single and double oven options available. Its 60cm Electric Built-In (CVEP614SA) features pyrolytic self-cleaning, seven cooking programs and an integrated electric grill, all for $1,349RRP. Chef was rated three stars for overall satisfaction and for most other categories, except for functionality where it was rated four stars..
Beko is a Turkish domestic appliance and consumer electronics brand. 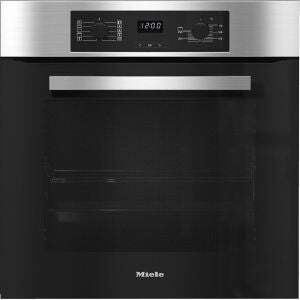 It offers a modest range of built-in ovens with close to 20 at the time of writing. It boasts extra-large capacities, with most models being 81L and above. Along with single ovens, there is also a double oven option available. Expect black design finishes with cool to the touch doors. Some models may also feature removable side racks, key lock and “Excellent Clean” Nano Coating Technology. 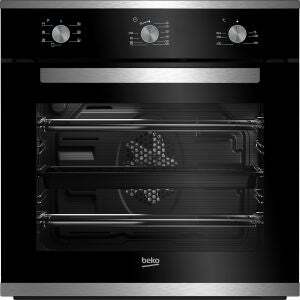 You can find some of the Beko oven range at under $1,000, while others sit close to the $1,800 mark. Italian brand Ilve caters for both home and professional cooks. It has been around for over 60 years and specialises in high-end ovens. Ilve boasts a significant number of ovens – both gas and electric – with the aim of bringing character into the range. There are options for both single and double ovens, so you can choose according to the capacity you will require. Expect features such as Quickstart pre-heat functions, dual capillary thermostats and triple glazed cool touch athermic doors and handles. Prices start at around $1,300 and can go up to $4,500 and above. Omega is an appliance company specialising in kitchen appliances like microwaves, dishwashers and indeed ovens. Omega claims over 30 years of experience in the Australian market and its range of ovens is quite large. With many models made in Italy, Omega’s ovens typically boast large capacities built for families of four or six, and many models will feature safe-touch glass and pyrolytic self-cleaning. Others come with auto-cooking functions, customisable racks and touch controls. Many Omega ovens are priced around $1,000 – $1,500, but expect the ‘Made in Italy’ models to fetch a slight premium. There’s nothing like having the aroma of a Sunday roast fill the home, which is why choosing the right oven for your needs is essential. Apart from choosing the type – built-in single oven, built-in double oven, built-under oven or freestanding oven etc. 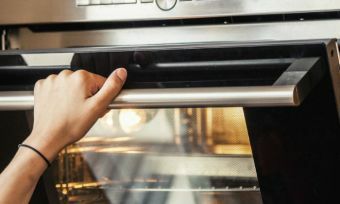 – there are several factors worth considering before you jump into a purchase to ensure you buy the best oven for your household’s needs, including size, fuel type, features, cooking functions and price. 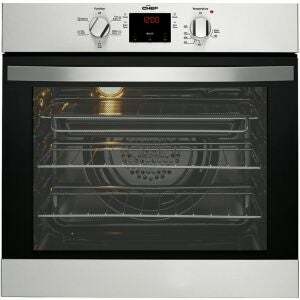 There are a number of different sized ovens catering for various household needs. The size given in centimetres, such as 60cm and 90cm for example, are the outside dimensions, while the oven’s cavity is measured in litres, giving you an estimate of how much food can be cooked at a time. Built-in single models generally have the smallest capacity, whereas built-in doubles have more space. Furthermore, the number of shelves available also alters the amount of food you can cook, with a 50L three shelf oven allowing you to cook more than a 60L two shelf option, for example. There are two types of fuel options for ovens – gas and electric. Both have their pros and cons. When deciding which to go with, it will ultimately come down to your budget, how you prefer to cook, and what you’re looking to cook with it. A convenient feature that some ovens come with is self-cleaning. It’s ideal for those who use their oven regularly, saving you some elbow grease. Pyrolytic ovens feature a cleaning cycle that can burn away fat splashes and food spills. It then turns it into fine ash that you can simply wipe away. This typically takes three hours for the full cycle to be completed and does use intense heat and energy. Many ovens are equipped with numerous settings and controls. According to our research, one in five (20%) Aussies are confused by all the different cooking functions on their oven, so you’re not alone on this one. Common settings include steam, to keep the ideal humidity level for your food, grill, defrosting and baking setting to help regulate the oven’s moisture for your sweet treats like cakes and muffins. How much energy does an oven use? Naturally your budget determines which oven you will ultimately go with. The good news is you’ll find perfectly capable ovens at many different price points. However, generally prices start at no lower than $600, unless you find one on sale. Ultimately, you’ll want an oven that lives up to your cooking expectations, and doesn’t let you down at the end of a long, hard day. This review is based on the real world experiences of Aussie consumers just like you, so we hope you find this report helpful in your search for a new oven. Canstar Blue commissioned Colmar Brunton to survey 3,500 Australian adults across a range of categories to measure and track customer satisfaction. The outcomes reported are the results from customers within the survey group who have an oven installed in their home and have used it in the last 3 years – in this case, 834 people. What oven temperature should you use to cook fish? Or cupcakes? We run through the ideal cooking temperatures for various food types.